Who all enjoyed that weather last night?! As much as we were dreading that 80 degree forecast, it actually wasn’t too bad! Especially for this amazing fall Fells Point engagement session in downtown Baltimore with Kelly and Jon! They chose Fell’s Point in Baltimore to have their engagement session because this is where their love story began! They even had their first date in Baltimore! Jon actually went to college with Kelly’s sister – so I think it’s safe to say that we should give Kelly’s sister some match making credit because these two really do just GET each other. When Jon proposed, Kelly had come home from her sisters bachelorette, straight off the plane, and found rose petals leading to their backyard where he had made a sign for each word of “Will you marry me Kelly?” Complete with tons of candles on the patio and lights strung on the signs! He left no details out for sweet Kelly and of course she said YES! Now they get to plan the wedding of their dreams in St. Michael’s, Maryland this coming June! It’s going to be here before we know it and we can not WAIT!! 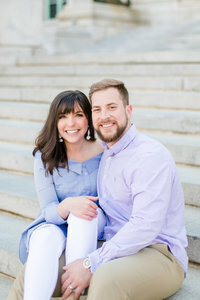 Kelly & Jon, thank you for showing me a side of Baltimore that we have never seen before (yes, I’ve never been to Fell’s Point – I live under a rock) – Tony and I are totally going to make a date night there soon!